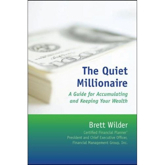 Book Review: The Quiet Millionaire By Brett Wilder. Discover who the real you is and what you really want out of life. Use the building block questioning process to determine what is important about money to you. Plan to make sure money is your servant, not your master. Be specific about where you are going and how you are going to get there in order to become and stay the quiet millionaire. This is a huge book…and by huge I mean both in heft and in the great advice inside. It can easily replace most if not all of your personal finance books, with chapters on maintaining positive cash flow, owning the right assets, tax issues, choosing the right insurance, paying for college and finally the best part…how to quit working while still maintaining your current lifestyle. I have read a lot of personal finance books and this book is both thorough and easy to understand for both the experienced financial whiz and the person needing help gaining control of their finances. It is well worth a read, and will be taking up space on my bookshelf for a long time. And coincidentally, right now there is a giveaway for a copy of this book over at Money Ning. He has 4 copies of the book to giveaway this Saturday October 6th. So if you are interested in seeing what this book is all about, you might want to head over there and enter the giveaway. Good luck! I’m really intriqued by this book…thanks for writing about it. I love the fact he talks about personal self discovery. In my experience, creating wealth is a combination of doing the inner work and the outer work…but you don’t see a lot of discussion about doing the personal work in most financial books.